Easy Dinner from Thyme for Cooking: Spring Greens Salad with Ham and Asparagus. I originally used smoked turkey in this, but it's unavailable here so I switched to ham. 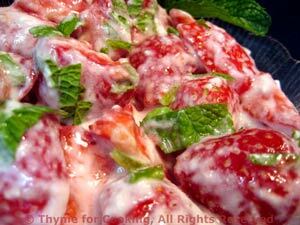 The Creamy Herb Dressing is similar to a commercial Ranch dressing. This should finish the goat cheese and the radishes. A variation on a Cobb Salad with the emphasis on spring: asparagus, radishes and spring greens. Roll cut (cut the end off at an angle, roll 1/4 turn and cut next piece at an angle, roll 1/4 and cut next piece, etc.) asparagus in 1 1/2 inch (4 cm) lengths. When boiling, drop in asparagus and parboil for 2 minutes if green, 3 if white. Prepare greens and put into a large bowl. Add a bit of dressing and toss well with tongs to combine. Taste and adjust dressing. Arrange on a shallow platter, flat salad bowl or two plates. Slice ham/turkey into strips and cheese into rounds. 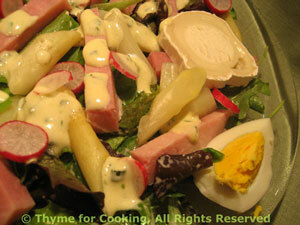 Arrange ham, eggs, asparagus, radishes and cheese nicely on top of greens. Drizzle a bit of dressing over all and serve, extra dressing on the side. Whisk together the yogurt, mustard and lemon juice. Drizzle in the olive oil, whisking constantly. Stir in herbs. This will keep a week in the refrigerator.